Easy Markdown has been updated to version 1.8. At the end of each year I have a look at the website analytics to see which items were the most popular. Over the year there were 70,000 unique visitors with 25% visiting the site on multiple occasions. The US provided 30% of the visitors and the UK 7% with Germany, India and France around 5%. As you might expect the majority were Mac users (56%), but there were also Windows (25%), iOS (12%), and Android (2.5%) users. Of the Mac users, 51% are now using 10.14 (Mojave), 27% 10.13 with all older versions each well below 10%. Chrome and Safari were the preferred browsers with both around 40%. The popularity of the Fortran on a Mac page has continued for several years now and it has been updated several times with user provided information. The update to Mojave seems to have been another daily smooth transition, with most software developers reporting no major issues. A couple of recent additions have generated significant interest. Which versions of Mac OS and iOS are in use? I'm occasionally approached by developers asking about the versions of Mac OS or iOS the visitors to the site are using. Whilst you can get general information from sites like NetMarketShare or Mixpanel I guess it is useful to know what versions scientists might be using. Over the last month the operating systems used by visitors are 60% Mac, 21% Windows, 12% iOS, 4% Linux, 2.8% Android. These figures would suggest that visitors to the site are probably among the early adopters, and that Chemistry software developers should try and ensure they support the latest versions of operating systems as early as possible. A summer promotion is offering 12 applications at discount prices, pick and choose the ones you want. Whilst there are many sites that track the compatibility on common desktop applications, it is often difficult to find out information about scientific applications. Based on the number of page views on the lists for Sierra, El Capitan and Yosemite it is apparently a useful resource. The major change with High Sierra is the update to the file system so hopefully this will be a benign update, but a Time Machine backup is always a good idea. I’ll update the list regularly and feel free to send in information. High Sierra is a major download 5GB and a couple of people have asked if it is possible to keep the installer and then use it on multiple machines. The initial installer is small (15 MB) but after the main installer has successfully downloaded (5GB+), when you are prompted to start the installation process, click Cancel, and the installer will be in the /Applications folder. You must make a copy of this to another location; otherwise if you launch the installer and it completes the High Sierra update, it'll be deleted. When you upgrade to macOS High Sierra, systems with all flash storage configurations are converted automatically. Systems with hard disk drives (HDD) and Fusion drives won't be converted to APFS. You can't opt-out of the transition to APFS. AppleScriptObjC there are a couple of bugs, because the issues stem from the .bridgesupport file, they will potentially pose problems in other languages that use the scripting bridge. 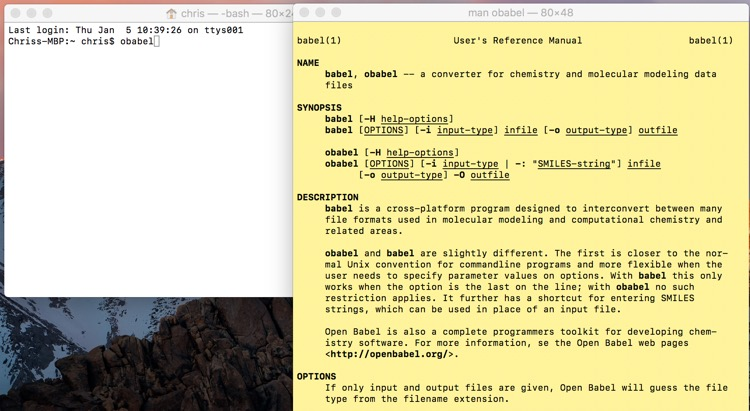 BBEdit have a comprehensive list of compatibility notes for each application and versions https://www.barebones.com/support/new-os.html. BBEdit 12 has just been released which bring full High Sierra compatibility. Cresset No issues to date, more detailed testing underway. Microsoft have already announced the results of preliminary testing of the Office suite. Office 15.34 and earlier. These versions are not supported on 10.13. In some cases, you may not be able to launch the Office apps. Office for Mac 2011. Word, Excel, PowerPoint, Outlook and Lync have not been tested on macOS 10.13 High Sierra, and no formal support for this configuration will be provided. MOE There seem to be no problems running MOE 2016.0804 or higher on MacOS 10.13. StarDrop Our initial tests suggest that everything is working as expected. xQuartz "I would like to report that xquartz now works in the latest macOS 10.13". Download here https://www.xquartz.org. Apple have announced a major new update of Mac OS X, version 10.13 High Sierra has a number of significant changes and it is likely that applications may need to be updated. Beta test versions of the operating system have been available for a while now and the more proactive developers have already been testing their software. Unfortunately there will always be developers who seem to refuse to test their applications until the new Mac OS has been officially released. Apple have updated the online support documentation to give more details about the new file system (APFS) that is coming with the next generation of the operating system High Sierra. 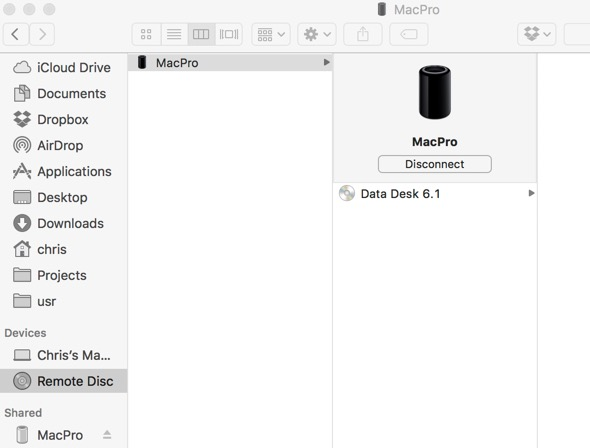 Apple File System (APFS), is the default file system in macOS High Sierra for Mac computers with all flash storage, it is designed to scale from an Apple watch to a Mac Pro. Apple File System is a new, modern file system for iOS, macOS, tvOS, and watchOS. It is optimized for Flash/SSD storage and features strong encryption, copy-on-write metadata, space sharing, cloning for files and directories, snapshots, fast directory sizing, atomic safe-save primitives, and improved file system fundamentals. APFS replaces HFS+ as the default file system for iOS 10.3 and later, and macOS High Sierra and later. A few things that might be important to note. FileVault volumes are converted from HFS+ to APFS, just like unencrypted volumes. Devices formatted as HFS+ can be read and written to by devices formatted as APFS. Devices formatted as APFS can be read and written to by any APFS-formatted devices but only by HFS+ formatted devices running macOS 10.12.6 or later. Volumes formatted with APFS can't offer share points over the network using AFP. SMB and NFS are supported when using APFS. The option to enforce only SMB-encrypted share points is also available. APFS is optimized for SSD storage, it will work with traditional hard disk drives as well. No need to repartition, APFS allows Space Sharing, which lets multiple file systems share the same underlying free space on a physical volume rather than use a fixed amount of space for each file system. APFS supports sparse files, extended file attributes and TRIM operations, as well as using a copy-on-write metadata scheme to ensure that updates to the file system are crash-safe. Apple File System supports encryption natively, both single key encryption and multi-key encryption (where each file is encrypted with a separate key, and metadata is encrypted with a different key). It is almost certain that any third party disc utilities will need to be updated. Once upgraded to APFS the only way to return to HFS+ is to erase the disc losing all data. APFS implements normalization and case insensitivity according to the Unicode 9.0 standard; this enables APFS to support a wider range of languages for these features than HFS+, which is based on Unicode 3.2. However beta testers report issues with languages that include non-Roman characters. Hopefully this will be addressed soon. Adds Siri support for cricket scores 😄, schedules, and player rosters from the Indian Premier League and International Cricket Council. Xcode 8.3 brings faster builds for large projects containing both Objective C and Swift. Siri support in iOS simulator. Xcode 8.3 no longer supports Swift 2.3 so you will need to update. Also updates for Pages, Keynote and Numbers. As a happy owner of a new MacBook Pro I am aware of the limitations of only having USB-C connectors. It is clear that this is the future since Apple are not the only company to make this transition. However a number of the scientific application I use regularly were supplied on DVD and I suspect others may be in a similar situation so I thought I'd mention this tip. Instead of investing in an adaptor if you have an older Mac you can use DVD or CD sharing. 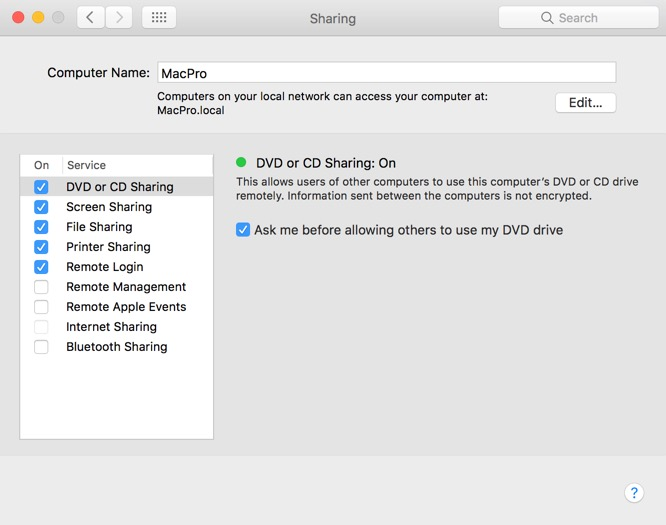 Open up system preferences and select "Sharing", click the checkbox for "DVD or CD Sharing". You can then use it as normal. Whilst there are many sites that track the compatibility on common desktop applications, it is often difficult to find out information about scientific applications. I’ll update the list regularly and feel free to send in information. When I compiled a similar lists for Yosemite and El Capitan they proved very popular with 13,000 page views, I hope this page is similarly useful. 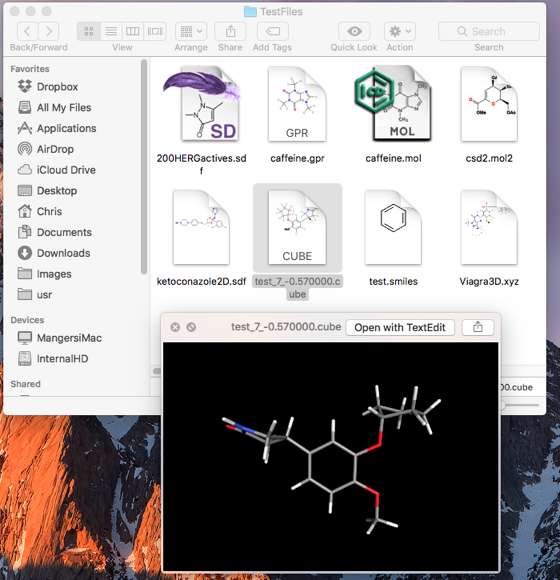 ChemDraw the official line is that it is not supported, even under El Capitan there were reports of copy/paste issues. One user reports “ChemDraw 15 is working fine for me. copy/paste, everything without issues”. DEVONagent has been updated to version 3.9.5 to support Sierra, in addition this update brings support for Qwant. DEVONthink has also been updated for Sierra. EndNote From Endnote (Thomson Reuters) version 7: Message for Mac user planning to update to Sierra: In preparation for Apple's release of macOS Sierra on September 20, we have been testing various versions of EndNote. Through our testing, we discovered some issues with the EndNote PDF viewer. These issues have been reported to Apple, but in the meantime, we recommend that you DO NOT upgrade to macOS Sierra. Evernote a bug in some versions of Evernote for Mac that can cause images and other attachments to be deleted from a note under specific conditions. We've released an updated version of Evernote for Mac, version 6.9.1, to resolve this. Homebrew, after every update it is worth checking your homebrew installation. 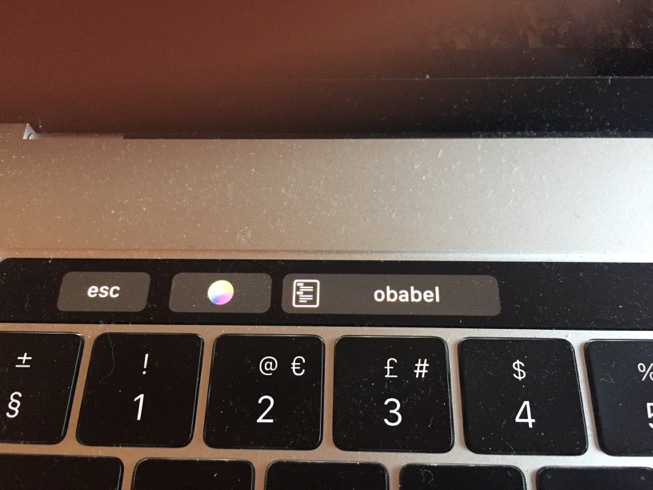 iBabel seems to work fine with the latest version of OpenBabel under Sierra. One advantage to updating to OpenBabel 2.4.0 is that previews now work with Quicklook. Lego Mindstorms At the moment everything seems to be running really great on Sierra. However, please let you readers know they are welcome to contact us via the website way you did if they run into any errors. We'd be happy to solve them! MarvinSketch I had to reinstall Java for Mac OSX this is the last version of Java Apple created to support legacy applications, similarly MarvinSpace and MarvinView. Matlab in general appears to be fine except for certain language localisations these languages a patch is available for download. A patch is also available for MATLAB Runtime R2016b. Mathematica 11.0.1 has been compatibility tested with macOS Sierra and you should not run into any OS-specific compatibility issues. The font-panel is disabled, but we are actively working to address this as soon as possible. It then works perfectly. Update, just had an email from CCG support, The problem with the MOE app launcher on MacOSX Sierra has been fixed in the MOE 2016 release. MOPAC all seems to be working fine. Pandoc depends on llvm-3.5, not supported on Sierra. Llvm-3.9 is supported, installation using Homebrew seems to be OK.
rdkit installed using home-brew works fine. Readcube Version 2.22.13732 is Mac OS Sierra (v10.12) compatibility update. Scansnap Note for using ScanSnap or ScanSnap Applications on macOS Sierra In order to avoid the ScanSnap compatibility problems, please do not use ScanSnap or ScanSnap applications on macOS Sierra in the following manner as doing so may cause some pages to be deleted or to become blank. Do not use [ScanSnap Organizer], [ScanSnap Merge Pages], or [CardMinder] Do not use Excellent mode when scanning A3 (11.7 in. x 16.5 in.) documents No image data will be lost nor any blank pages produced when content that has been scanned in the A4 (8.3 in. x 11.7 in. ), Letter (8.5 in. x 11 in. ), Legal (8.5 in. x 14 in. ), or smaller sizes is saved. Schrodinger a reader sent in this response. We received your query regarding MacOS Sierra. Unfortunately our current, 2016-3 release, do not yet support MacOS Sierra but we have plans to include support for this OS for the upcoming 2016-4 release of our software. SeeSAR version 5.3 now, 5.4 will come out shortly. No compatibility issues observed/reported. Vortex no problems so far, the embedded chemical drawing app Elemental appears to have no issues. XQuartz did not require reinstallation :-) however there are reports of an intermittent display not found error when launching apps from a Linux box. Allow applications downloaded from anywhere in macOS Sierra, if you open the security panel in the Settings the default options in Sierra are as shown below. There is no longer the option to open applications from Anywhere. I’ll add more updates later. IBM’s Fletcher Previn delivered an update on the company’s rollout of Macs at the Jamf Nation User Conference this week. 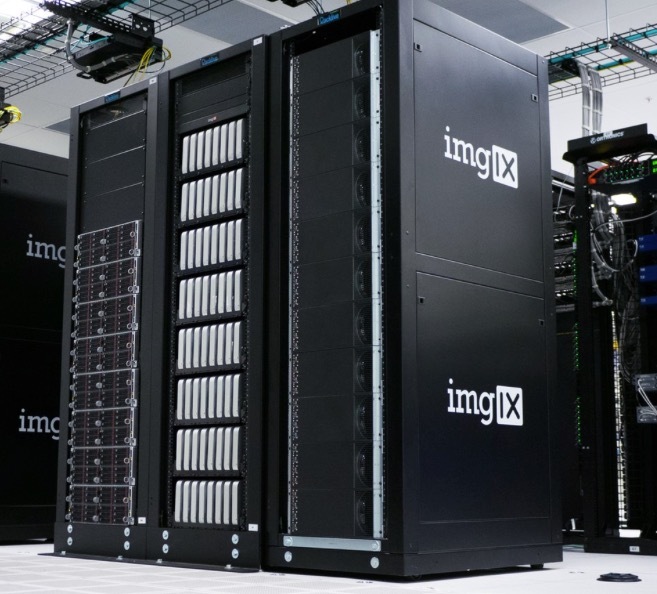 IBM plans to reach over 100,000 Macs by the end of the year and is now deploying 1300 a week on average. 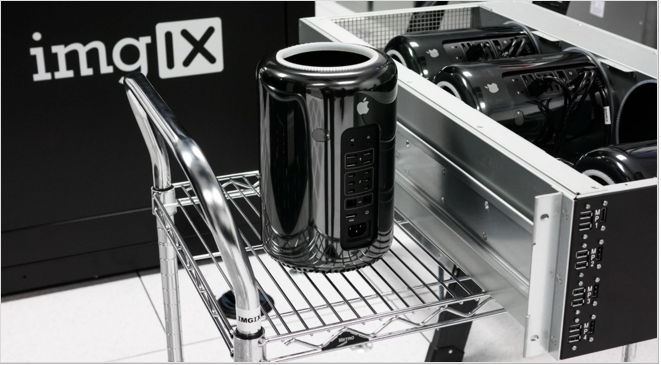 “I can confidently say every Mac that we buy is making and saving IBM money” said Previn. IBM is saving a minimum of $265 (up to $535 depending on model) per Mac compared to a Lenovo PC, over a 4-year lifespan. The latest market share data is available from NetMarketShare.com, Mac market share has been rising over the last few years and in April hit a peak of 9.20%, largely at the expense of Windows. With considerable help from Nat Echols, we can now build coot automatically every night a new revision is available. I have two versions, built on two different computers. The 10.6 version should run on 10.6.8 or greater. The 10.9 version is for 10.9 or later.. The package installer will install everything in /Library/Coot. Unfortunately, it breaks if you move it. A wrapper shell script called "coot" will reside in /usr/local/bin/coot when you are done. Coot (Crystallographic Object-Oriented Toolkit) is for macromolecular model building, model completion and validation, particularly suitable for protein modelling using X-ray data. Coot displays maps and models and allows model manipulations such as idealization, real space refinement, manual rotation/translation, rigid-body fitting, ligand search, solvation, mutations, rotamers, Ramachandran plots, skeletonization, non-crystallographic symmetry and more. I've also added a link on the Spectroscopy page. I recently became aware of a new company specialising in software for scientists Shazino have developed a number of interesting applications for both Mac OS X and iOS. 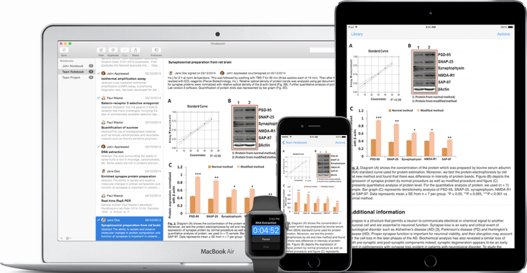 The best known app is PaperShip an iPad, iPhone, and Mac application designed to help you keep your articles organized with your Mendeley or Zotero library. However they also provide a couple of smaller apps that make life easier in the lab. Laboratory Timer, Fast Counter and SciKey a scientific keyboard. The latest addition is an electronic labNotebook called Hivebench, this is available for both MacOSX and iOS. Looking at the website it seems to be aimed at molecular biologists/biochemists, and there is a free version that allows unto 10 scientists to collaborate. 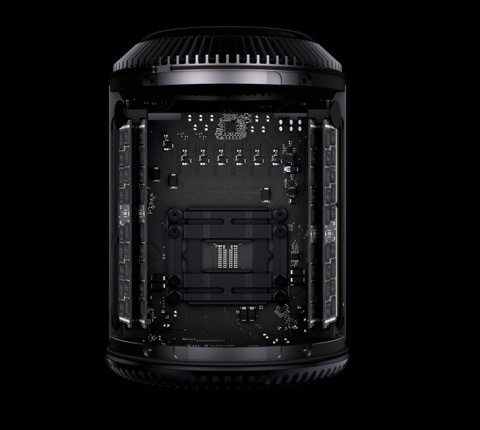 've posted a couple of entires where I've been looking at the computing power of the new MacPros however this site caught my eye because it shows how the MacPro can be rack mounted. The rack mounted Mac minis also look pretty impressive. 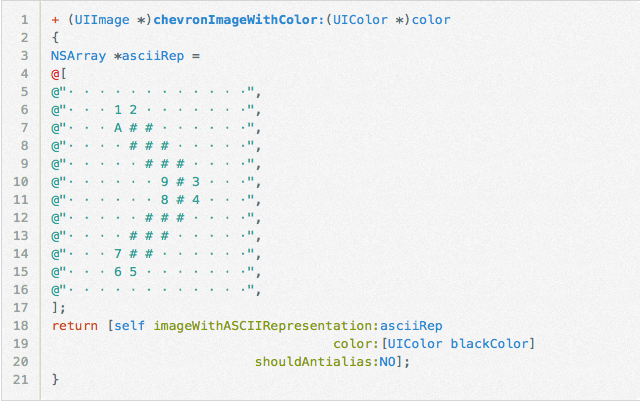 A really clever way to create icons using ascii art. It is open-source and released under the MIT license on GitHub. 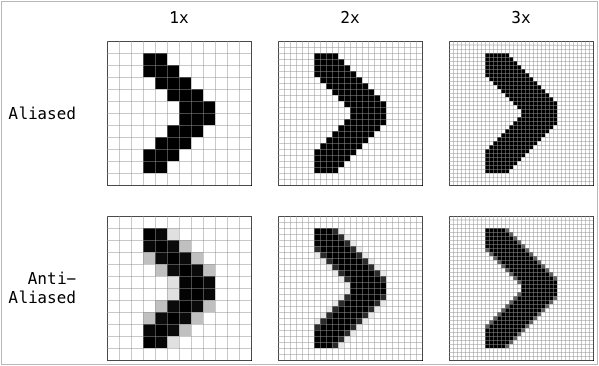 I think one of the real advantages of this is you can actually see the image you want to create in the code. I've just updated the page detailing compatibility of science applications under Yosemite of particular note is the update of Spartan’14 version 1.1.9 that includes the new Yosemite supported driver from SafeNet. I've continued to update the Scientific Applications under Yosemite we are now up to the 18th update. Many thanks for the people who have contributed. With over 5,000 people viewing the page it is clearly pretty useful. Apple has released the Darwin source code for OS X 10.10 here. This is an update to a blog post from early 2013 incorporating some valuable readers comments. For many years I’ve used the excellent Clipboardsharing to exchange the clipboard contents between my laptop and desktop machines, it also supports multiple clipboards. However it is not supported under Mac OS X 10.7.x (Lion) and the developer website seems to have disappeared. I spent a while looking at various alternatives and I thought I’d summarise my findings.